Lorna Lucille Bergey: businesswoman and community historian; born 29 May 1921 in Wilmot Township, Waterloo County, Ontario to Walter C. Shantz (13 April 1894-10 December 1987) and Selina (Shirk) Shantz (21 May 1898-14 June 1979). She was the oldest child in a family of three sons and five daughters. On 29 May 1940 she married David D. Bergey (1916-1980). They had two sons, Edward and Robert. Lorna died 22 March 2009, and is buried in the Blenheim Mennonite cemetery. Lorna grew up on the family farm, and attended the local public school through grade eight. She was only 12 years of age at this time. She passed her high school entrance exams, but following the custom within much of the the Mennonite community her education ended at that time, and she worked at home helping to raise her younger siblings. Nonetheless she developed a lifelong interest in reading; and she recalled reading about church news in the Gospel Herald stored in her parent's home. She was a member of the Blenheim Mennonite Church until it closed, and later was a member at the Nith Valley Mennonite Church and First Mennonite Church in Kitchener after she moved to the city during retirement. After marriage to David Bergey on her 19th birthday, she lived on the Bergey family farm west of New Dundee, Ontario where they farmed and operated a cheese stand at the Galt Farmers Market. In 1954 David suffered serious injury in a 14 meter fall from a silo, and Lorna was forced to become the major financial support for the family. David and Lorna gave up farming and developed the Bergey Cheese business that also expanded to farmer's markets in Waterdown, Hamilton, Burlington and Milton, Ontario. When David was sufficiently recovered from his injuries, two cheese/deli shops were opened in Toronto and Hamilton. After David's death in 1980, she scaled back the business, and retired in 1988. In the 1950s Lorna became passionately interested in local history and the history of her Pennsylvania German Mennonite forebears. She joined the Waterloo Historical Society, and later the Pennsylvania German Folklore Society (secretary 1980-2005). She served as President of the Waterloo Historical Society in 1969. She was a founding member of the Mennonite Historical Society of Ontario, and served as its secretary from 1968-2000. She also served on the Mennonite Historical Society of Canada (treasurer, 1980-1985), Mennonite Bicentennial Commission (1983-1993), and the Historical Committee of the Mennonite Church (1969-1979). 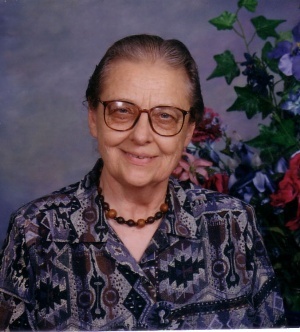 She was historian for the Mennonite Conference of Ontario (1971-1988) and served on the Historical Committee of Mennonite Church Eastern Canada (1988-1994). She was also active with Doon Pioneer Village, and was central to establishing the Brubacher House Museum on the University of Waterloo campus and the restoration of the Detweiler Meetinghouse near Roseville, Ontario. She was acting archivist at the Mennonite Archives of Ontario from 1967-1974. In the business world she served on the credit committee of the Mennonite Savings & Credit Union and was secretary of the Eastwood Mennonite Community where she lived in retirement. Lorna's frequent role as committee secretary was characteristic. She held organizational positions that got the work done. Her minutes were meticulous, and her reports detailed. She was the Society member who would do the mailings, sit at the display table in malls, seek out the donation of artifacts for the Brubacher House Museum, and speak to elementary school classes. A special gift Lorna had was developing tours of various Mennonite communities in Ontario. Lorna "put feet" under the projects that others thought up. Lorna's greatest impact, however, may have been her influence on the academic historical interpretation of Ontario Mennonite history. Lorna was always aware that she attended school fewer years than the people who consulted with her. Although Lorna was modest about her education, academics streamed to her door for direction to sources, counsel on interpretation of the Pennsylvania German Mennonite story, and basic fact-checking on Ontario Swiss Mennonites. She sat on the all the reading committees for the three-volume Mennonites in Canada series written by Frank H. Epp and Ted Regehr, and vigorously championed the place of Pennsylvania German Mennonites in Canadian history. Her contribution is acknowledged in many volumes of Ontario Mennonite history. Bergey, Lorna L. Lorna (Shantz) Bergey : her literary legacy. Markham, Ont. : Pennsylvania German Folklore Society of Ontario, 2011. "Bergey, Lorna Lucille (nee Shantz)." The Record (24 March 2009). Hill, Valerie. "A Lover of Local History: Lorna Bergey of Cambridge." The Record (14 April 2009): B3. Lorna Bergey's papers are at the Mennonite Archives of Ontario. Steiner, Sam. "Bergey, Lorna Lucille (1921-2009)." Global Anabaptist Mennonite Encyclopedia Online. May 2009. Web. 22 Apr 2019. http://gameo.org/index.php?title=Bergey,_Lorna_Lucille_(1921-2009)&oldid=147054. Steiner, Sam. (May 2009). Bergey, Lorna Lucille (1921-2009). Global Anabaptist Mennonite Encyclopedia Online. Retrieved 22 April 2019, from http://gameo.org/index.php?title=Bergey,_Lorna_Lucille_(1921-2009)&oldid=147054. This page was last modified on 26 January 2017, at 15:27.